Easy Shrimp Boil is a classic recipe made just ONE POT with andouille sausage, corn, potatoes, and shrimp boiled in a seasoned broth, ready in under 45 minutes! 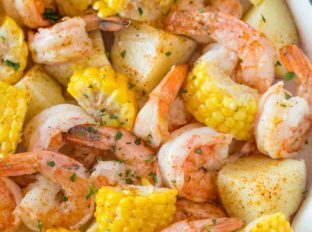 A seafood boil is the perfect dish for a summer gathering, and if you love this you’ll also love my BBQ Cajun Shrimp, Shrimp and Grits, Shrimp Scampi, Baked Shrimp Scampi and Pesto Shrimp! 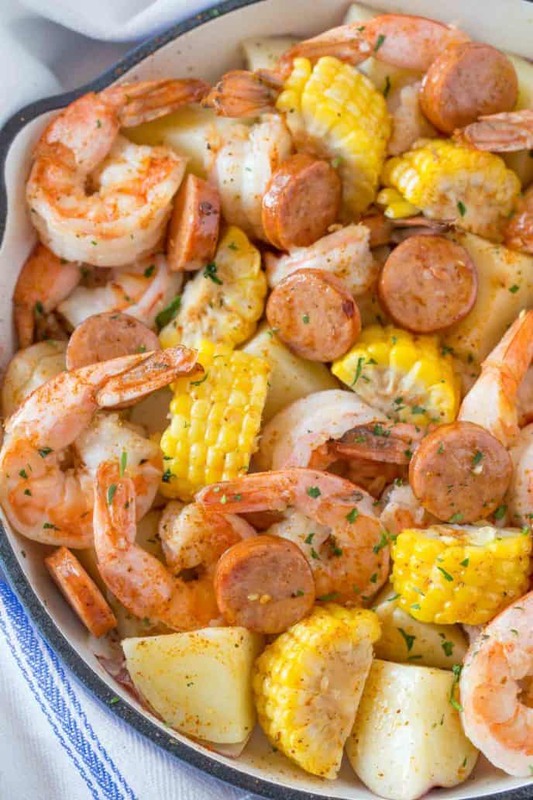 Easy Shrimp Boil is the PERFECT recipe made with fresh shrimp, andouille sausage, potatoes, and corn still on the cob. We’re using a homemade seasoning instead of Old Bay seasoning here because it’s quick and easy. You can add crab or crayfish to this shrimp boil recipe if you want to, and I always serve this with plenty of lemon wedges! WHAT CAN YOU SERVE WITH EASY SHRIMP BOIL? Shrimp Boil Seasoning can be homemade, or you can use Old Bay Seasoning. Honestly, I like to make the homemade version because I feel like I already have all of these seasonings in my house, and it’s one less thing to buy. For this seasoning you’ll need these spices. HOW DO I PREP FRESH SHRIMP FOR A BOIL? For this shrimp boil recipe, we’re leaving the shrimp unpeeled while it cooks. This helps lock in a lot of the juices and flavor, along with the seasoned broth, and makes the shrimp incredibly tender and juicy. You can ask for the shrimp to be deveined when you buy it, too. HOW LONG SHOULD I BOIL SHRIMP FOR? Shrimp cooks very quickly, and we’re only boiling it for 3 minutes before adding ice to the broth. If you add the shrimp too soon it will turn out overcooked and rubbery. Drain the boil, then you can either pour it out onto a baking sheet lined with parchment paper, or onto a table covered with newspaper. I’ve made this using other ingredients like crab, whole garlic instead of just cloves, and quartered russet potatoes instead of red potatoes. You can also use kielbasa instead of andouille sausage. 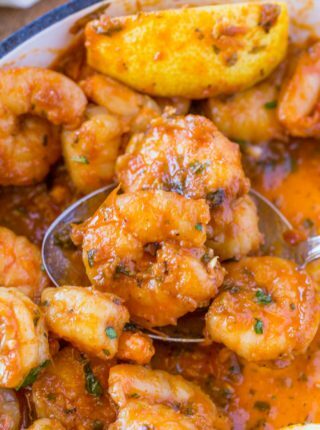 I don’t recommend using frozen shrimp for this recipe because the cooking time will be different and it won’t be as flavorful as fresh shrimp. But if that’s what you have, make sure to defrost the shrimp completely before boiling. Top with fresh parsley when serving. Combine first 12 ingredients (through cayenne pepper) and 8 cups water in a large pot (preferably with a strainer insert). Add the potatoes, and corn and simmer for 10 minutes. Remove them, along with the onions to a pan and add in the shrimp and sausage until the shrimp are just cooked through, about 3 minutes. Turn off heat, add 4 cups ice cubes, and let the pot sit for 5 minutes. Remove shrimp and sausage and combine with the corn and potatoes and onions on a baking sheet. Serve with hot sauce on the side (optional) and halved lemons. This is a sponsored post written by me on behalf of Hefty. Hi! 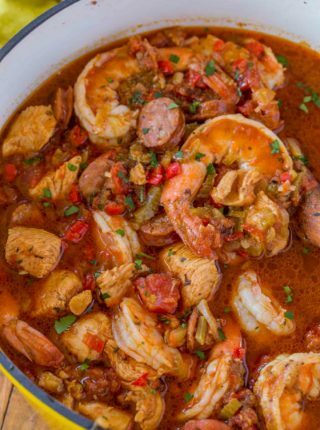 If we are making this with Old Bay seasoning instead of homemade (I don’t have a lot of ingredients listed), how much is needed for this recipe? Thanks in advance! I’ve never testd it but I would think you would need about 1/4 cup of Old Bay to substitute the seasonings. Remember, you can always add more to your liking. Enjoy! This shrimp dinner was amazing! I love how easy it is to make! Can’t believe this is ready in just 45 minutes! So easy and delicious! Definitely! I hope you enjoy it. So easy and flavorful – we will make this one again and again! I made this for a dinner with friends and it was a huge hit! Thank you for sharing! You’re welcome, Anna! Thanks for the 5 stars. We were invited to a shrimp boil last weekend and it was incredible! I can’t wait to make do this on my own! Hi Sabrina – can this be made in an instapot? I’ve not tested it but I’m sure there’s a recipe online with similar ingredients that you could follow as a guideline to help. Good luck! Sabrina I’d love to make this recipe but my husband is allergic to Fish…..Is there anything else I could use instead of Shrimp? Meanwhile, slice along the back of each shrimp through the shells; remove the veins and rinse the shrimp. Add to the pot, cover and cook until the shrimp curl and are just opaque, 2 to 3 minutes. 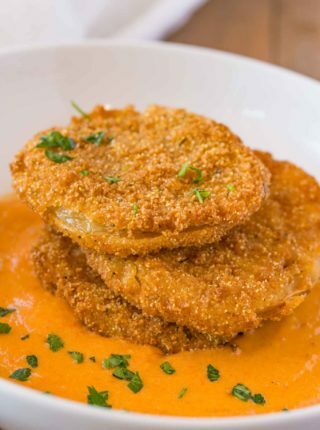 You had me at easy and okay shrimp! Thanks for the advice about how to do a shrimp boil AND how to clean up afterwards! Best thing to come out of One Pot! I love this! 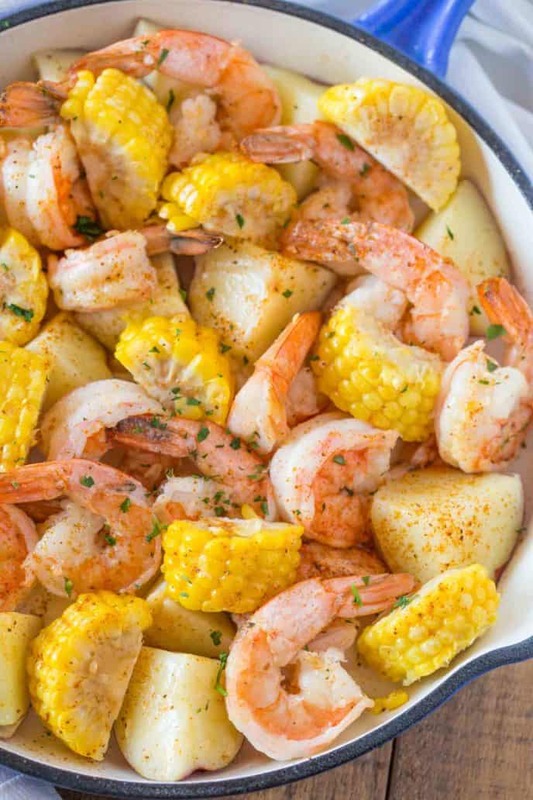 This shrimp boil of yours is also known in the Carolina’s and Southern East Coast as Frogmore stew, or “a low country South Carolina dish”. In Virginia it’s known as a Low-Country Boil and some areas of the south refer to it as Beaufordt Stew. Now I have had this “Boil” in many parts of the country including CA and found the technique in making it when to add spices and how much is a matter of technique. Sorry to say but I have never had a “Boil” in CA that had much taste or flavor. I found the best “Boil” to be in central South Carolina. 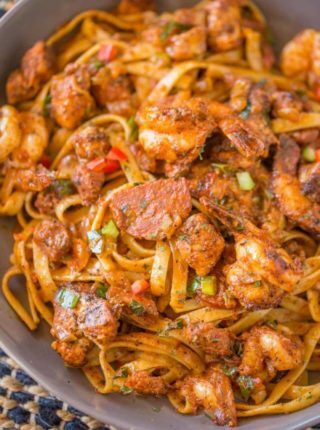 Love all the colors and flavors in this dish! This dish screams summer to me! My family will love it! I don’t cook seafood very often, but when I do I love meals like this one! So quick and easy! Seriously! How great for a party! One of my favorite meals ever! Perfect way to beat those odors and still enjoy such a perfect summer meal!